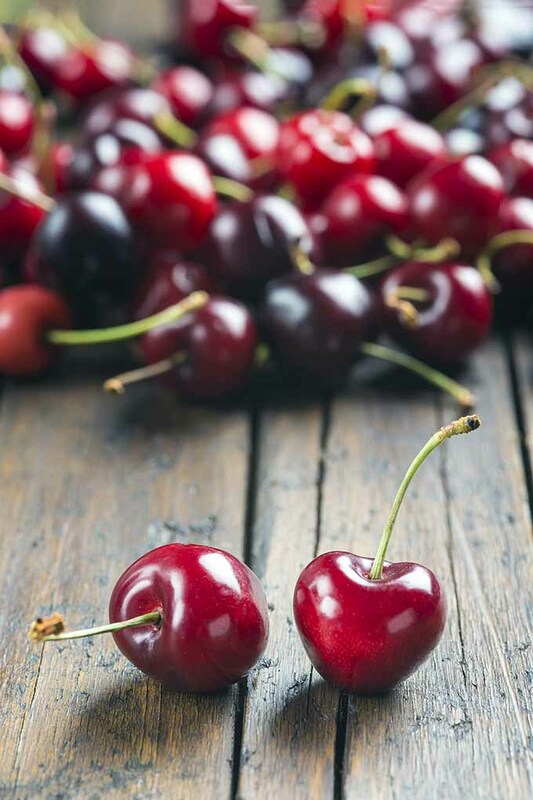 The cherry and the olive – two fruits whose flavor profiles could not be any more different from each other. One is fresh, sweet, and juicy. 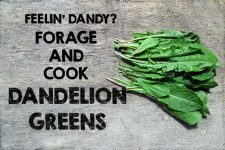 The other is briny, savory, and pungent. Fortunately, they also share the same solution – the perfect pitter tool! I used to work in a restaurant where we were getting crates upon crates of fresh cherries. And the only tool we had in the entire multi-kitchen facility was this old, rusty fork whose tines were manipulated and bent to facilitate fishing out the pits. How I wish this guide was available back when I was working there! 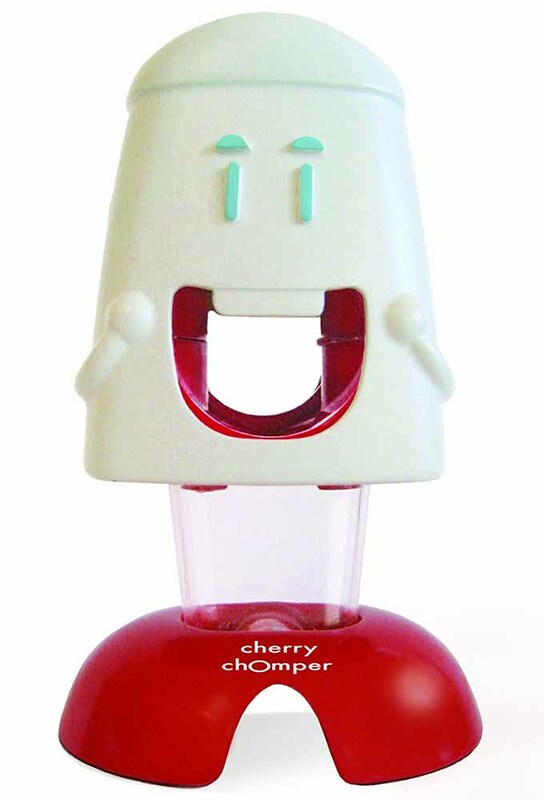 The OXO Good Grips Cherry and Olive Pitter updates the classic handheld cherry pitter for a more efficient product. It is a sleek tool that will fit well in any modern kitchen. With its sharp single pike, you will be able to pierce each pit with ease and precision. It is made in China, and is available to purchase in black or red. It has dimensions of 6-inches x 1-inch x 3-inches and weighs about 5 ounces. The pike used to pierce the cherries and olives is made from a sturdy, die-cast zinc. OXO uses zinc for its strength and hardness, resistance to corrosion, and outstanding finishing quality. 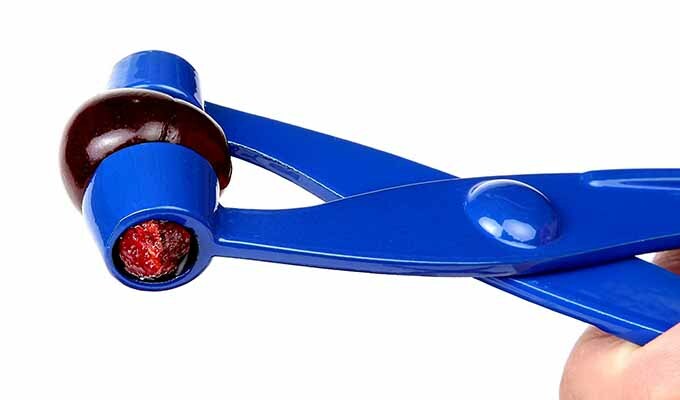 Considering that you may be pitting a few pounds of cherries or olives, you need a tool that is comfortable to handle for an extended period of time. OXO understands that comfort is just as essential as practicality. This design includes soft, comfortable, non-slip handles that absorb pressure each time you press down. One verified customer on Amazon reported appreciating this extra attention to the handle. He bought the tool for his wife, who has rheumatoid arthritis. And he was happy to report that she could use it without pain. The removable clear plastic splatter shield is a unique feature that acts as a chute, directing juices downwards to protect the work area, hands, and clothing from splatters. While it’s not flawless, the splatter shield does a decent job of keeping the work area (and yourself) clean from most of the juices that tend to squirt all over the place when removing pits. When you’re working with highly pigmented fresh fruit, this can be a huge bonus! Another great feature is that it accommodates different sizes of fruit, with no risk of mangling or bruising the various types. 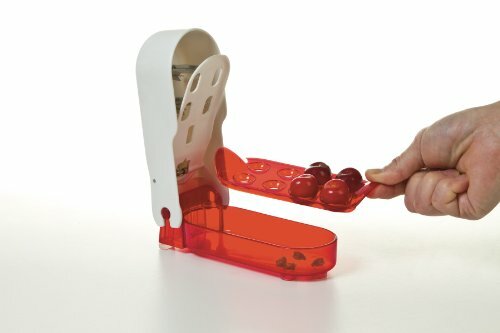 The crafty design of the holder can accommodate both large and small varieties of cherries and olives. The outer circumference is perfect for large olive or cherry varieties like Bing and Rainier while the interior recessed cup secures smaller kinds. Some customers, however, noted that there is a limit to how large of a fruit you can use. Bigger varieties of olives, like large green olives, could not fit properly in the mechanism. Because you are supposed to pit vertically rather than horizontally (which is the intended design of most pitting machines), it would not work for certain olives that are too long and rotund. Oppositely, some small varieties, like sour cherries, were too small and fell right through the opening. Just be mindful of the size of the fruit in comparison to the opening of the pitter. Many varieties are able to be pitted without concern. 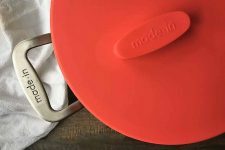 The device and the splatter shield are both dishwasher safe for easy cleanup. However, we highly recommend washing them by hand. Cleaning in the dishwasher does have many risks that you ought to avoid: the coating can lose integrity, the color can fade, and the plastic can crack or scratch when washed at higher temperatures. Also, because of the small size of the splatter shield, it could potentially fall into the bottom and the dishwasher and be destroyed. OXO went one step further to design it so that it locks for convenience storage when not in use. Detach the splatter shield on the bottom, keep the handles open so that the pike is fully extended, and fit the splatter shield inside the front pitting chamber. Clamp down on the handle, as if you were pitting, so that the pike is secured inside the splatter shield. Then, slide over the lock on the bottom of the device. The tool is now secured! This feature can be very easy to miss if you (like I have done many times) toss away the instruction manual the moment you open the package. Hold on to the manual, read over it – because this is a great feature! This is one tool whose parts you certainly will not lose… as long as you read the instructions! An OXO customer service representative explained that the company does not offer a warranty for any of their kitchen gadgets. However, there is a “Satisfaction Guaranteed” policy: if you are not satisfied within the first three months of using your purchase, you may return the item and either exchange it, get a replacement, or get a full refund. Check current prices and read customer reviews on Amazon now! Cherry and olive pitters are designed in a variety of styles. You should decide first whether you prefer a handheld, or one that is able to stand on its own. Please note that handheld models typically require more hand strength to operate than those that stand on their own. With handheld devices, you need enough hand strength to firmly press down on the tool to push the needle into the fruit to remove the seed. With options that are able to stand on their own, you use the solid surface of the table or counter for leverage when pressing down, minimizing exertion on your hand. These options can also accommodate a larger amount of items. It’s also important to consider how many pits you would like to remove at one time. 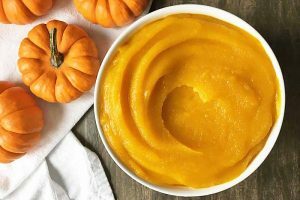 If you’re pitting a bushel of fresh fruit for canning and pie making, and you do this often, you might be looking for equipment that’s a bit different from what the more casual user who likes to pit a few olives for an occasional snack might need. There are two basic designs: single removal multiple removal models. Single removal models such as some of those reviewed in this article are designed to only remove one individual seed at a time. Multiple removal models are designed to simultaneously pit numerous pieces of fruit. Below we compare the advantages and disadvantages between single and multiple removal tools. A major advantage with the single removal designs is that you get better accuracy and precision. No two cherries or olives are exactly the same. You can adjust each individual fruit before extracting, to ensure that it is pierced by the needle in the most accurate spot. Being able to do this minimizes failed attempts and having to pierce it again. 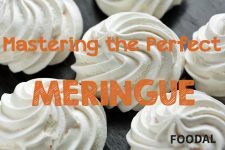 It also comes in handy when you want your final results to be pretty, such as when you’ll be arranging items on a charcuterie platter or making homemade maraschinos to top holiday cookies. The disadvantage? It does take some time to individually pit each one. Once you find your own cherry pitting groove (pun intended), it may become an enjoyable, therapeutic process! Imagine how quickly you can go through pounds of cherries or olives if you can pit 4, or even 6, at a time! 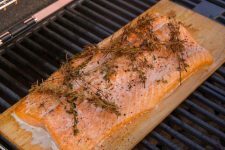 Especially if you tend to prep larger quantities, you should seriously consider the multiple removal options below. 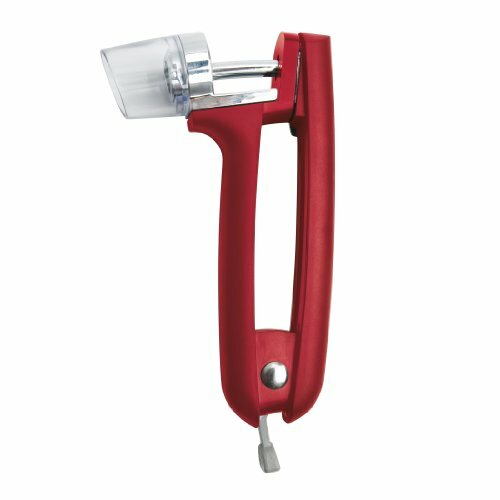 Handheld options give you more freedom to be able to customize exactly where the needle lands on each individual fruit. 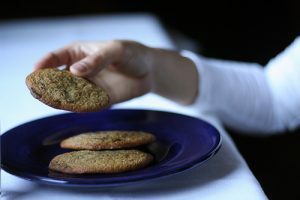 Though multiple removal options can pit more fruit at one time, they increase the risk of failed attempts. 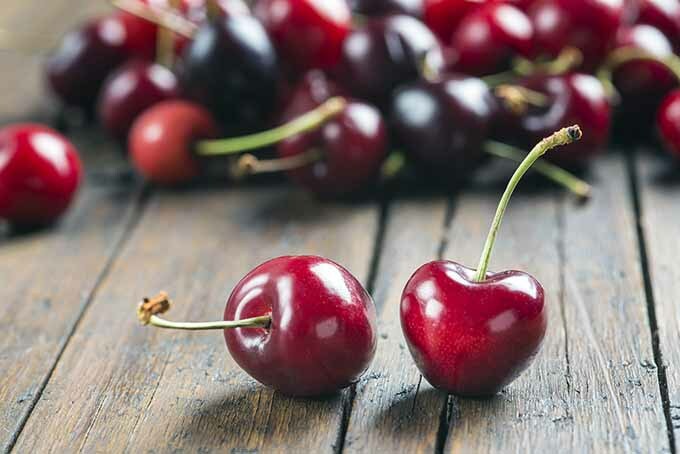 Again, each cherry or olive will have a different, slightly unique shape from its round or oblong brethren. One cherry or olive might be placed slightly askew on the stand, so its pit will not be removed, while all the others are. 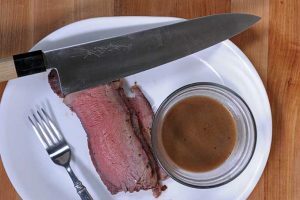 Or perhaps all of them are a little off-kilter with the pike – so no matter how hard you press down on the tool (or how loudly you scream out of frustration), the device will get jammed. In a perfect world, it would simultaneously remove each one flawlessly. Probably time for a reality check. It might take a couple of tries to reposition the fruit and make sure each pit is removed successfully, probably more often than you would like. Another major factor to consider is the type of material the tool is made from. For metal objects, you want a product made with a good quality metal that is heavy duty, with great strength and hardness, and a high resistance to corrosion. Metals such as stainless steel or zinc are ideal. Plastic is another material that’s often used to construct pitter tools. 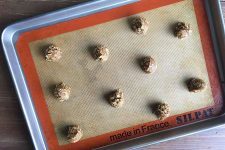 It is incredibly easy to clean (hello, dishwasher! ), lightweight, and relatively inexpensive. The biggest complaint with the plastic products is that use of this material sometimes cheapens the overall look and performance of the tool. Now that you are familiar with our most recommended model, let’s look into our other favorite picks! 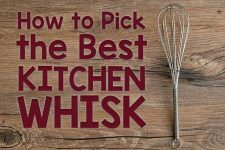 Finding the right cherry or olive stoner is like taking a personality test – you need to get the right one that suits who you are and your individual requirements. 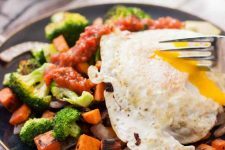 Foodal has carefully analyzed the top sellers on Amazon.com to find four different tools that each fit a specific need. Go on – take our pitter personality test, and find your perfect match! 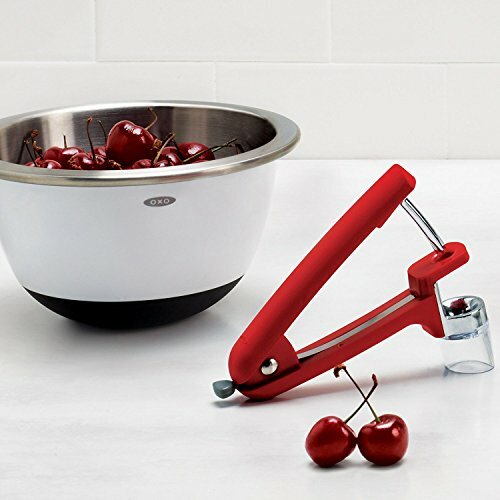 If you like a basic design that gets the job done without any bells and whistles, definitely purchase the Ionox Professional Cherry Pitter. Without any extra parts or a manual, it’s a tool that values practicality and a sensible design. No assembly required. No fuss. This handheld, device is made in China with a professional grade, heavy duty, non-corrosive solid zinc alloy that can withstand years of use. And it won’t tarnish, stain, or discolor. It is available in three different colors: black, red, and blue. 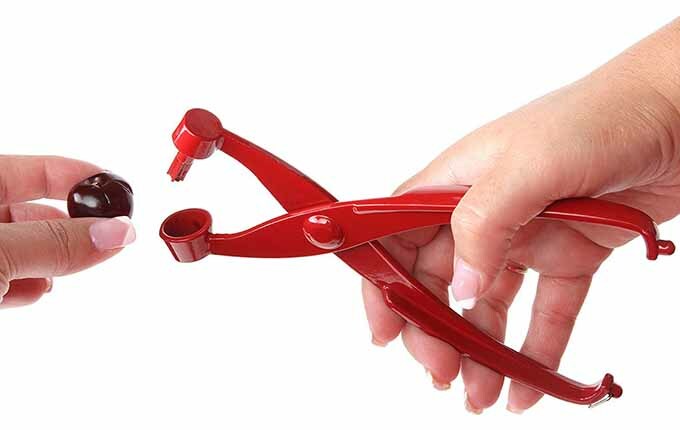 The internal spring makes it easy to use with one hand, while your other hand can continue to place the fruit on the holder without interruption. With dimensions of 7.4 inches x 1.3 inches x .5 inches, the tool is narrow enough that it can be used by any hand size, large and small, which makes it great for all ages. 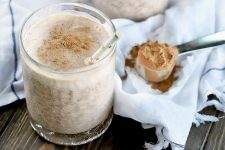 The spring is also completely sealed, so it will not collect any hard-to-clean food particles or juice. It is safe to clean in the dishwasher, as long as it is on the bottom shelf. It can also be cleaned simply with warm water and soap. 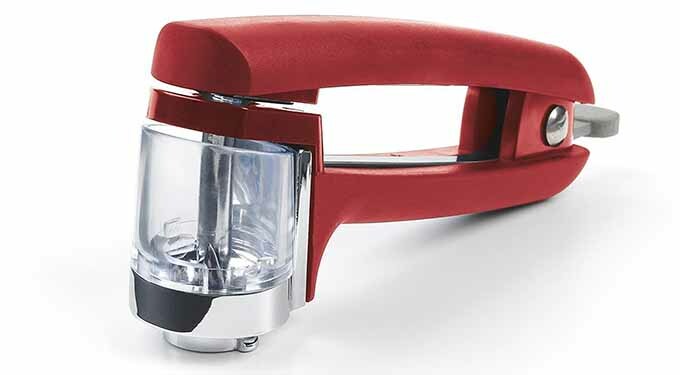 The manufacturer claims that the product will not melt in the dishwasher, which could be a risk with other products, such as the plastic splatter shield on the OXO brand pitter. A locking ring on the bottom of the handles is useful for flat, compact storage that takes up minimal space in your kitchen gadget drawer. During the first 90 days of purchase, the Ionox company will replace the product at no cost if it is defective. Better yet, the company also offers a lifetime warranty, after registering the product within 90 days of purchase. 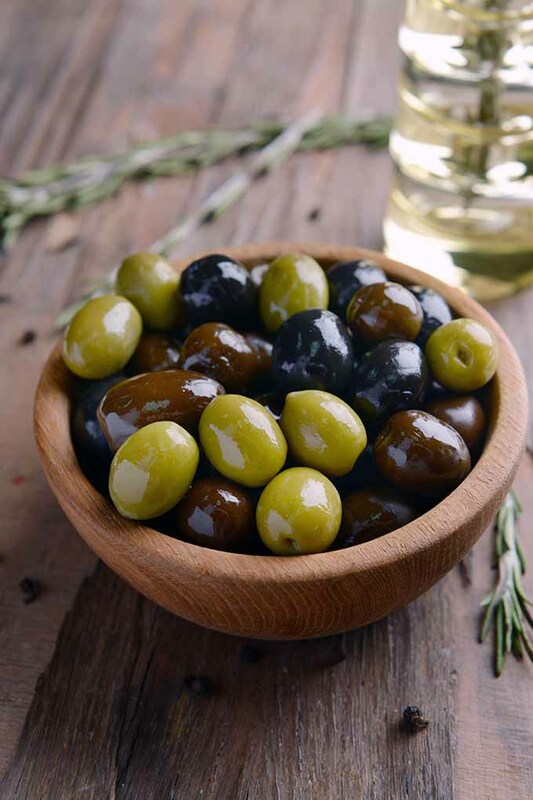 While large black olives and medium black and green olives worked out well, small ones would get too mangled, and large green olives were so firm that an outrageous amount of pressure needed to be applied. Include your children in the fun! The Talisman Designs Cherry Chomper is a kid-friendly choice for those seeking a more amusing, whimsical experience without sacrificing functionality. It works by placing a cherry or olive in the open mouth and pressing down on the top of its head. The pit and residual juices are then pushed into the clear plastic bottom container, leaving the fruit in the mouth. An unexpected bonus for some customers is that their children enjoyed watching the juice and pits being removed from the fruit, and to see all the contents in the clear compartment between the body and feet after extraction. It is made out of plastic, and is safe to clean in the dishwasher. 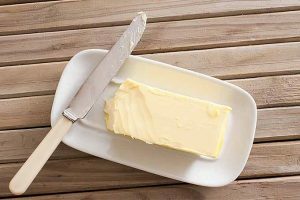 Plus, the bucktooth in the front is more than just a sweet quirk – it acts as a protective guard to ensure hands and fingers won’t be touched by any of the sharp components on the inside. 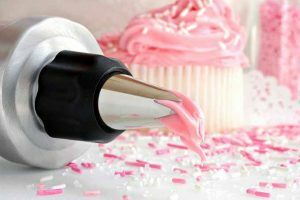 Despite the slower extraction rate, most customers thought that it effectively blended together fun, practicality, and responsibility. 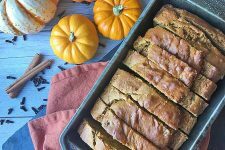 Kids with an interest in kitchen prep will love it. But don’t be embarrassed if you love it even more. 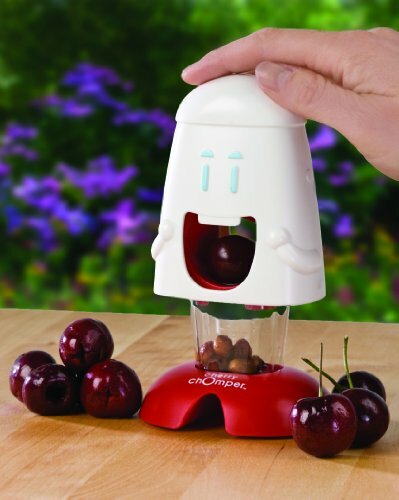 Come on, the Cherry Chomper is adorable! Maybe working on just one task at a time is not your thing? Progressive understands. 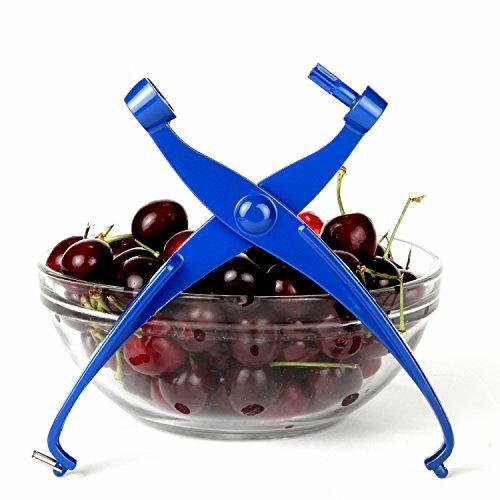 Prepworks by Progressive Cherry-It Pitter is a revolutionary product with a patent pending design that can extract the stones from four cherries or olives simultaneously. The dimensions are 7 inches x 2.9 inches x 2.2 inches. For a better visual reference, it looks like a very wide stapler, and uses the same spring-action movement as stapler. Three separate pieces are included with your purchase that all assemble together: the top piece with the attached zinc pikes, the tray to place the fruit on, and the bottom piece that stores all the residual seeds and juices. Aside from the pikes and metal spring-loaded mechanism for quick movement, most of the device is made out of plastic. It also has a non-skid base that won’t slide around on the counter as you are working. It is available in two different color combinations: either a white lid with a clear white base and tray, or a white lid with a clear red base and tray. For use, the fruits are placed in individual concave spots on a tray. The tray is removable and reversible – one side can fit up to four larger varieties, while the other side can fit up to four smaller fruits. 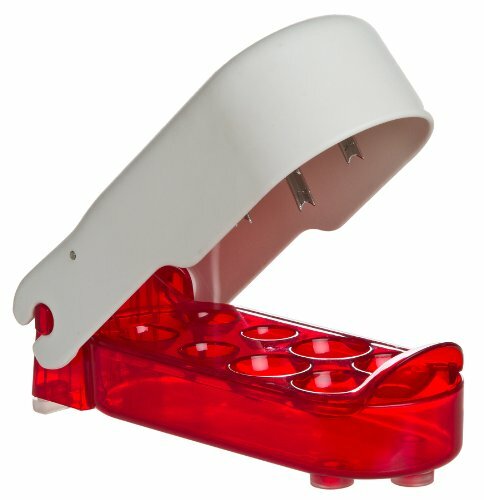 Similar to a stapler motion, you press down on the top part of the gadget where the extraction prongs are connected. The pits and any residual juices drop into the base container, leaving behind very little mess to clean up on your work area. 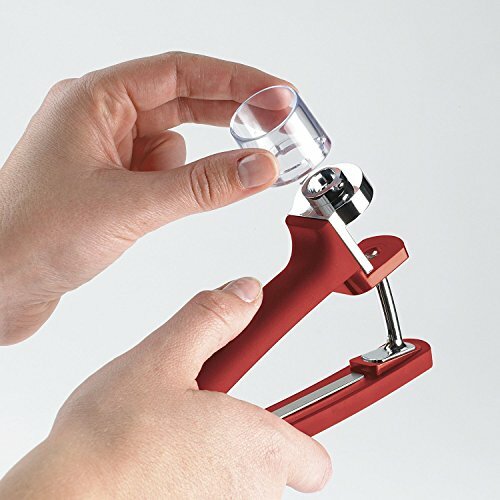 The tool disassembles for easy cleaning by hand or in the dishwasher, and locks tightly for compact storage. Just press the lid down and slide the switch on lock mode to keep it closed and locked in place. 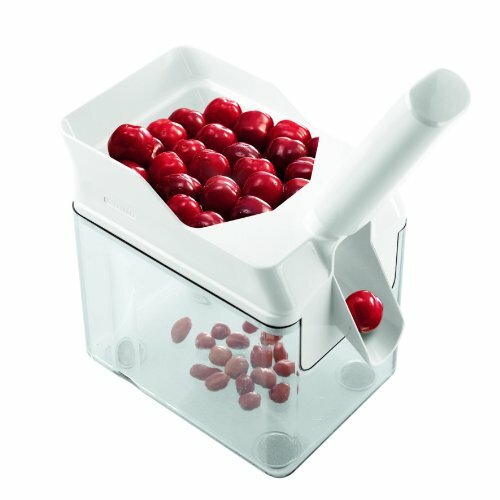 Looking for a tool that extracts even more fruit at one time? 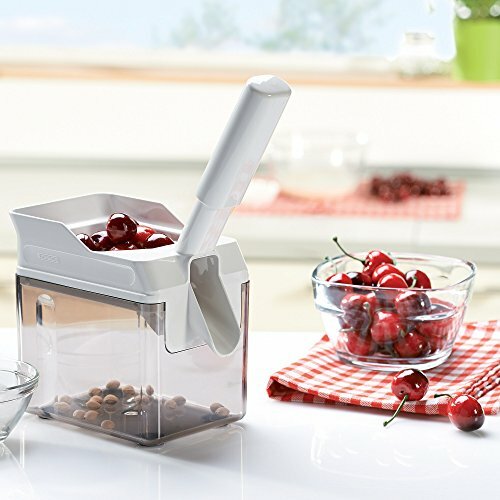 The same company also sells the Prepworks by Progressive Cherry Pitter. It is a very similar design, but can pit up to six pieces of fruit. This model is patented with dimensions of 8 inches x 4.2 inches by 2 inches. It is made out of the same materials and is designed in a similar way as the 4-piece model. It is a 3-part assembly with the lid, tray (which is not reversible), and non-skid bottom container that stores all the scrap pieces. It also has a switch on the lid that keeps the whole device closed when you are not using it. 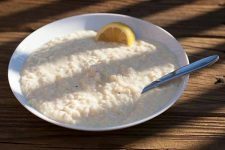 With both of these models, verified customers liked that the fruit remained intact, because of the well-designed metal prongs. One end left a small “x,” while the other end left a small hole where the seed was extracted. The rest of the fruit kept its original shape without being crushed. As for the complaints, some customers were disappointed that the devices did not always extract every single pit, and multiple tries were required. Be sure to align your fruit in the same direction, in an upright position, to ensure that you use the tool successfully, with less of a chance of needing a redo. If you define happiness by your beautifully stocked stash of bulk-item supplies in your storage rooms, buy the pitter that shares your passion. 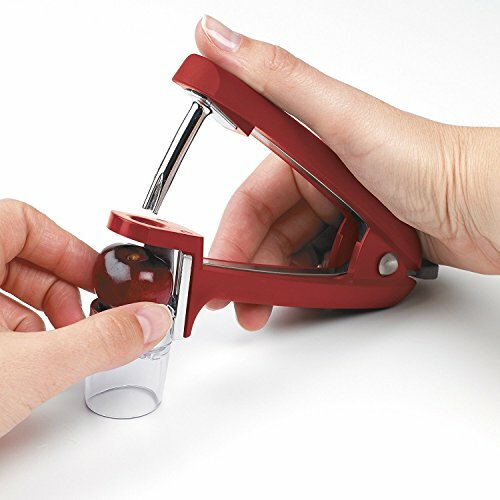 With the Leifheit Cherrymat, you can pile a large quantity of cherries and olives as you’re pitting, without needing to refill the tool after each piece. Leifheit is designed to remove a lot of pits at a rapid pace. The company claims it can extract up to 25 pounds of cherries in one hour. This German designed and engineered device measures 10.5 x 4.5 x 6 inches, which provides plenty of storage space for both the whole fruit on top as well as the leftover seeds and juices in the bottom container. Leifheit is a rectangular-shaped tool comprised of two separate pieces that attach to each other. The bottom piece is a clear, plastic bin with no cover that stores all the residual seeds and juices. 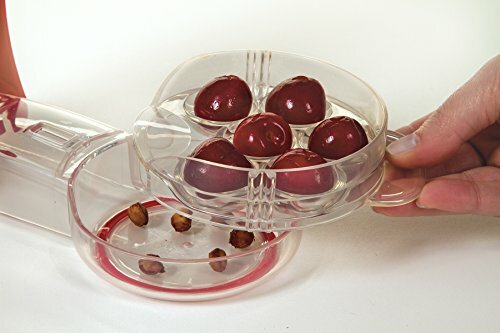 It fits underneath the top piece, which is a white, plastic “lid” made up of three components: a spring-action plunger with stainless steel pike, a shallow storage unit for loading all unpitted cherries and olives, and the exiting ramp. How does it work? Once all of the cherries or olives are placed in the top section, you then press down on the attached spring-action plunger. The stainless steel pike inside the unit removes the pit from the fruit and disposes it in the bottom section. As soon as this happens, the cherry or olive will exit the device by rolling down an angled ramp. The tool is doing most of the work for you! All you have to do is continually press down on the plunger as the fruit rolls out of it. You will need to place a separate bowl or container directly under the exiting ramp in order to collect the finished fruit that rolls down. Leifheit offers a 2-year warranty, and replacements parts are available to purchase for both the steel springs and the gaskets. The steel springs are located in the spring-loaded plunger, and the gasket is inserted underneath the top piece to direct and secure the metal pike with each push motion. 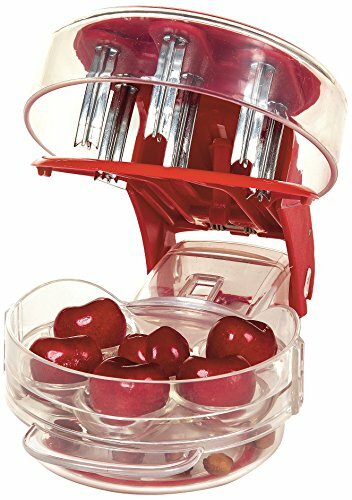 The major complaints from verified buyers on Amazon were that olives and cherries would get stuck in the chute because they were too big, and that the plunger would miss removing an occasional pit. Use something firm and narrow (like a reusable plastic straw or a metal skewer) to gently push down cherries or olives if they get stuck in the chute. Please, for your own safety, do not use your fingers! What to Do with All of Those Perfectly Pitted Fruits? We hope that you can find your own perfect match with our review! 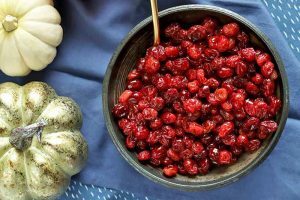 Once you do, you will definitely reap the rewards of pitting your favorite varieties of cherries and olives. 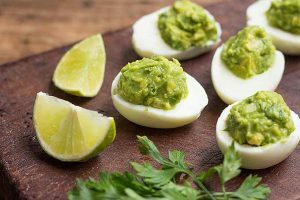 Curious about what to make with your freshly prepped products? 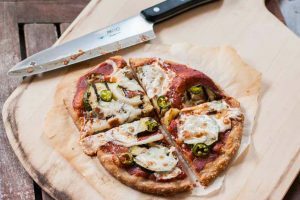 Use olives to provide a briny balance on a cheese board or make a sweet homemade pie or cook up a batch of jam with the cherries. What’s your own pitter personality? How do you like to use cherries and olives in your own home cooking? Be sure to post in the comment section below. Product photos via various manufacturers: OXO, Ionox, Talisman, Prepworks by Progressive, and Leifheit. Uncredited photos: Shutterstock.